Last Friday, 11 May, as part of the ‘Great March of Return’ protests, hundreds of Palestinians broke into the Palestinian side of the crossing, causing extensive damage. 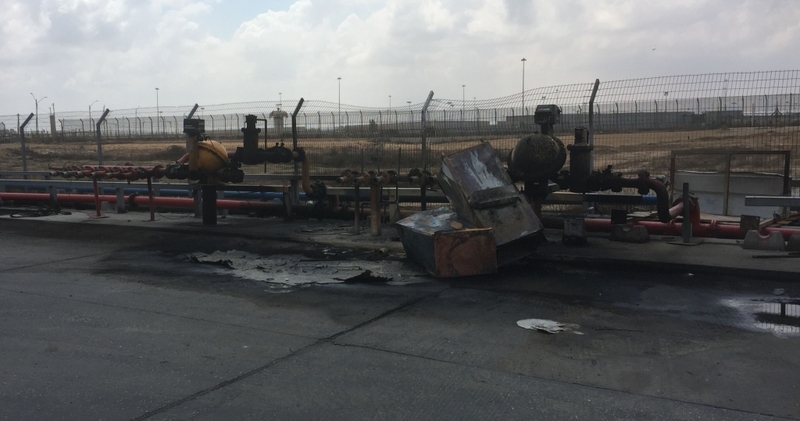 Initial reports indicate that the control room, the main conveyer belt and the fuel and cooking gas pipelines were set on fire and severely damaged. Israel and the Palestinian Authority announced the closure of the crossing until further notice, pending repair of the damage. Despite this, the Israeli authorities have indicated that the crossing will be opened for “select humanitarian needs”, which will be examined on a case-by-case basis. Through this arrangement, seven trucks entered Gaza today, at least six of which were carrying medical supplies. Given the recent deterioration in the longstanding energy crisis affecting Gaza, the impact of the destruction of the fuel and gas lines is already being felt. The Gaza City municipality decided today to reduce solid waste collection services in order to save fuel and ensure operations for a longer period (approximately ten days). The 13 public hospitals in Gaza have sufficient fuel reserves to continue operations for seven days. However, NGO-supported health facilities have fuel for only three days, while water and sanitation facilities only have five days left of fuel. Following the shutdown of Gaza’s power plant approximately one month ago, along with the disruption of electricity supply from Egypt, Gaza has been depending almost exclusively on electricity purchased from Israel, allowing for only two to four hours of electricity per day. To mitigate the impact of the electricity shortage, the United Nations, through the support of international donors, has been providing over 220 critical health, water and sanitation, and solid waste facilities with 936,000 litres of emergency fuel per month to run backup generators and vehicles. Only about one quarter of the planned distributions of emergency fuel during May has been so far completed, while the reserves have already been nearly exhausted. To avoid a collapse of essential services, an alternative arrangement for the entry of fuel is urgently needed until the Kerem Shalom fuel pipelines are repaired. The closure of the crossing comes at a critical time for the health system in Gaza, which is struggling to respond to the massive influx of trauma injuries since 30 March, in the context of the demonstrations near the perimeter fence. According to the Palestine Ministry of Health (MoH) in Gaza, 27 per cent of the drug items and over 40 per cent of the medical disposable needed to treat trauma casualties are currently unavailable. In general, 50 per cent of all essential drugs have less than one month’s supply (are at “zero stock”) and 40 per cent have already been completely depleted. The shortages in oncology and hematology have reached an unprecedented rate of 80 per cent. To address these shortfalls, the MoH in Ramallah has recently sent 200 pallets of medical supplies to Gaza, of which 174 have already entered, including dozens that the Israeli authorities exceptionally permitted to enter through Kerem Shalom today. Another 164 pallets of supplies from other Health Cluster partners are currently stored at Ashdod Port in Israel, pending final release from customs and delivery to Gaza in the coming one to two weeks. These supplies, including items for blood banks and drugs essential for emergencies, will serve approximately 70,000 people in Gaza. These critically needed items will require exceptional arrangements to enter. The Food Security Sector in Gaza estimated today that stocks of most currently available items are sufficient for at least one month, except for dairy products that will last for only 7-10 days. Market assessments are planned in the coming days to reassess food availability. Shortages of cooking gas and diesel fuel are expected to disrupt bread production in bakeries and households cooking capacity across Gaza. Yesterday, 12 May, the Palestinian Petroleum Authority ordered cooking gas stations to halt supply in order to rationalize the distribution of available stocks. The availability of animal fodder and eggs are also expected to be affected by a prolonged closure of Kerem Shalom. In anticipation for the expected mass demonstrations, the Erez passenger crossing with Israel will be closed on 14 and 15 May, except for urgent humanitarian cases, and will reopen for permit holders on 16 May.